With only 11 days until the curtain is drawn on “Strikeforce: Henderson vs. Babalu II,” it appears the card will now feature a new co-main event. 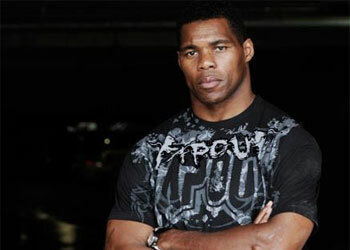 Unfortunately, Herschel Walker sustained a deep cut under his left eye that required multiple stitches and will be forced to pull out his heavyweight scrap against Scott Carson. Walker made his mixed martial arts debut against Greg Nagy this past January. The chiseled 48-year-old was looking to build upon his impressive 3rdRound TKO victory against the little known Carson. Although it wasn’t confirmed in the press release, the wording in the bulletin would lead one to believe the heavyweight battle between Antonio Silva and Valentijn Overeem has been promoted to the night’s co-main event. The former NFL star is expected back in early 2011. The San Jose, California-based promotion did not mention whether Carson would remain on the card. “Strikeforce: Henderson vs. Babalu II” takes place December 4th inside the Scottrade Center in St. Louis, Missouri. Renato “Babalu” Sobral will be granted his long awaited rematch against Dan Henderson in the card’s featured attraction. Showtime will broadcast the star-studded extravaganza beginning at 10PM ET/PT.